The Faculty of Engineering at Strathclyde is delighted to offer the Dr Alex Ekwueme Scholarship for a Nigerian student commencing their postgraduate taught programme in engineering from September 2018. Applicants to this scholarship must hold an offer to study a postgraduate taught programme within the Faculty of Engineering from September 2018. Architecture, Electronic and electrical engineering, Civil and environmental engineering, Biomedical engineering, Design manufacture and engineering management, Mechanical and aerospace engineering, Chemical and process engineering, Naval architecture, ocean and marine engineering. 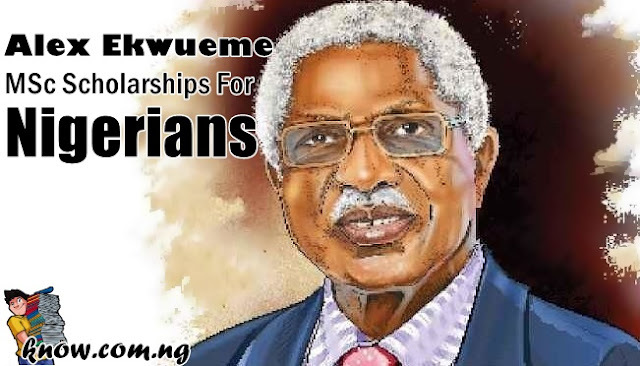 Applicants are asked to complete the Dr Alex Ekwueme Commemorative Scholarship Application Form. The forms will be reviewed by Faculty of Engineering staff and one successful applicant will be selected. To apply or know more about the application, please visit the official website Strath.ac.uk.